Beautiful coastline, scenic drives & hiking. This tour centres around one of the most beautiful fjords in Norway—Hardangerfjord, where travelers can explore hiking trails, cascading waterfalls and Viking landmarks. The hills are lined with fruit trees and lush green grass. Day 1: Arrival & Welcome to the fjords! Arrive to Bergen Airport. For an easy and comfortable way to get to your hotel in central Bergen, we are happy to arrange a private transfer for you. Despite being Norway’s second largest city and a major cruise port, Bergen has retained the atmosphere and charm of a small town. 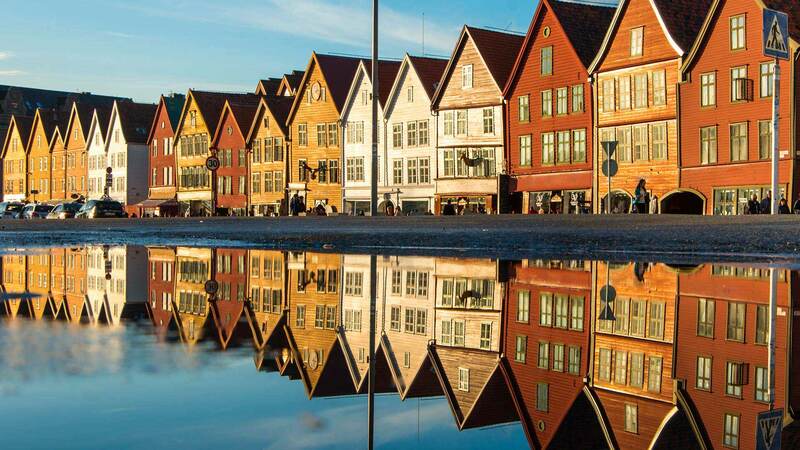 Here you will find the old wharf of Bryggen—a UNESCO World Heritage site, centuries-old houses, a vibrant fish and flower market and an interesting group of museums. For a good overview of Bergen, take the one-hour “mini-train” sightseeing tour through city centre, which includes sights like Maria Church, the Rosenkrantz Tower and King Håkon’s Hall as well as a panoramic view of the city from Fjellveien Road. If you arrive early, we recommend getting the Bergen Card, which provides free travel on all public transport, free admission to museums and discounts on other attractions, sightseeing tours, restaurants and shops. Collect your rental car in the morning and start your self-drive from Bergen to the Norwegian countryside. 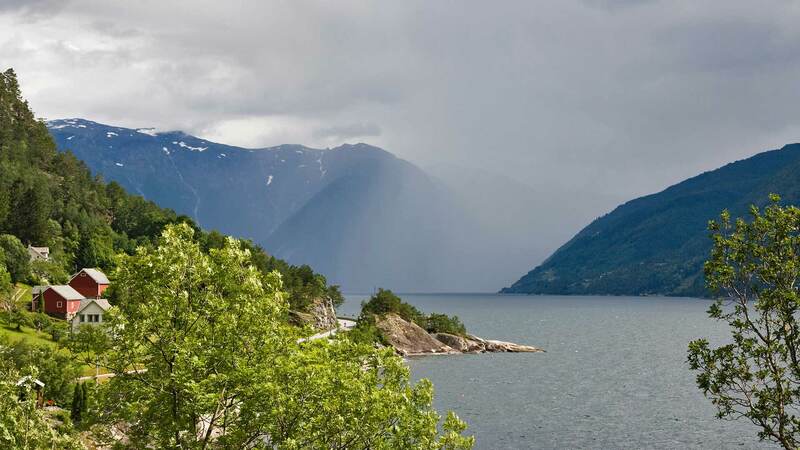 Enjoy the day as you drive towards the scenic Hardangerfjord, the 2nd longest fjord in Norway. The fjord is famous for its lush landscape, and in mountainsides is home to numerous apple trees. In the spring time, the trees are in full bloom but if you are travelling during the late summer or early autumn, you will need to make a stop at one of the local fruit sellers and buy some fresh apples! Today will also be a waterfall themed day, as you will drive past the Steindalsfossen, which you can actually walk behind. It is worth taking the detour up to Vøringfossen waterfall, to enjoy the view from this 182-metre waterfall, cascading from the Hardangervidda Mountain plateau. After you visit the waterfall, you will return to Eidfjord, with a possible stop at the Hardangervidda Nature Center, before you continue towards Lofthus, where you will spend the night. For those that are fit enough to head out on a hiking trip of a lifetime, today is the day for you when you take a trip up to the famous Trolltunga. The tour is a difficult hike that will take the full day, or between 10 - 12 hours, but the views are as rewarding as it gets, both on the way and also when you arrive to the Trolltunga itself. 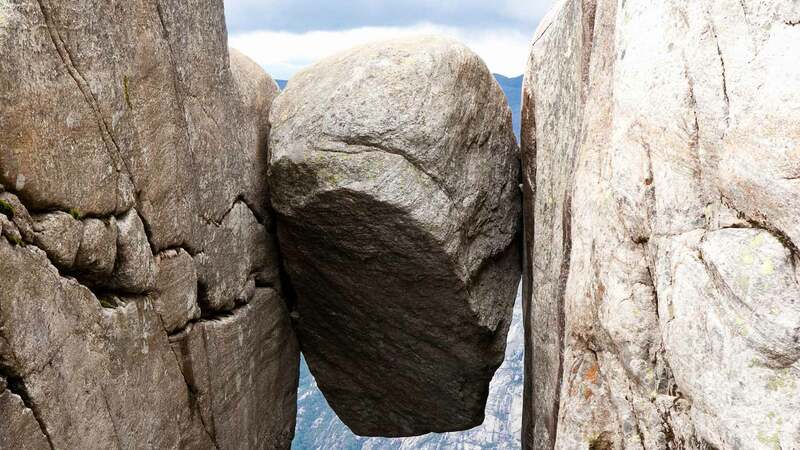 If you are not afraid of heights, a photo op on the rock itself is an excellent memento of your efforts – but remember to be careful and remain aware of your surroundings! If you are not interested in hiking, we suggest a visit to the spa facilities at Ullensvang Hotel, or to explore the Hardangerfjord area. It is also worth it to drive to Skjeggedal, the starting point of the hike, as the village is located in a very scenic place by the Ringedals Lake. Spend another night in Lofthus. Today you might want to enjoy a relaxing morning at your hotel, as your feet will definitely feel the effects of yesterday’s hike. When you are ready, it’s time to get back on the road and head south to Stavanger, Norway’s 4th largest city. You will be driving along the Ryfylke tourist road, taking you through some spectacular landscapes with interesting contrasts. You will find high mountains, green hillsides and deep fjords. And if you are up for some more climbing after your hike yesterday, you might want to make a stop at the Svandalsfossen waterfall, where the 540 steps bring you close to the waterfall and the lush surroundings. You will then continue south towards Lysefjorden, which you will pass on your way to Stavanger, your destination for the next 2 nights. Stavanger, the 4th largest city in Norway is a favourite among visitors for its lively city centre, timbered Old town (Gamle Stavanger) and historic harbour area. Here you will find interesting museums and attractions along with great restaurants and cafes. And not far from Stavanager is the gorgeous Lysefjord, which includes the famous natural landmarks of the Pulpit Rock (Preikestolen) and Kjærag Mountain with its dare-devil photo spot, the Kjeragbolten boulder. These impressive sights are accessible on optional tours that depart daily during the summer from city centre. Today you will make your way along the coastline towards Haugesund. On the way, we suggest a visit to Karmøy, where you will find many beautiful white sand beaches facing the North Sea, which is one of the top spots for windsurfing in Norway. On the island you will also find Avaldsnes, the Nordvegen History Center, where you can learn about the Vikings and the history of the name of the country – Norway. Continue the short drive to Haugesund, where you will spend the night. After a good breakfast at your hotel, you will close the circle by driving from Haugesund to Bergen. Along the route you will pass through the Bømlatunnell that goes underneath the Bømlafjord and also the Sandvikvåg-Halhjem ferry, which gives you an excellent opportunity to stretch your legs on the passenger deck of the boat. End the day in Bergen, where you will return your rental car and have time for your last dinner in Norway. Spend your last night in the north in Bergen. For transportation to Bergen-Flesland Airport, you can take the airport bus (Flybussen) from one of the various departure points in city centre or you can take a taxi directly from your hotel. If your flight is in the afternoon, you have the opportunity to do some last-minute shopping, visit one of Bergen‘s museums or enjoy a relaxing lunch at a café after this amazing journey. We recommend booking at least three weeks prior to departure. This package can be customised to meet your needs or extra nights can be added on request; contact us for details. If you want to do both the hike to Pulpit Rock & Kjerag Bolten you need an additional night in Stavanger. That can be added upon request. 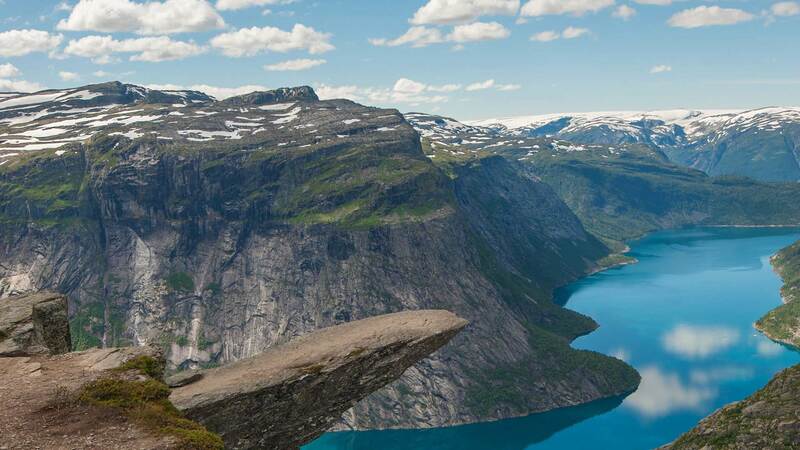 Trolltunga Hike: The hike is a full day excursion, estimated time is around 10-12 hours. You meet your guide in Skjeggedal at 08:30 at the Trolltunga Active store. 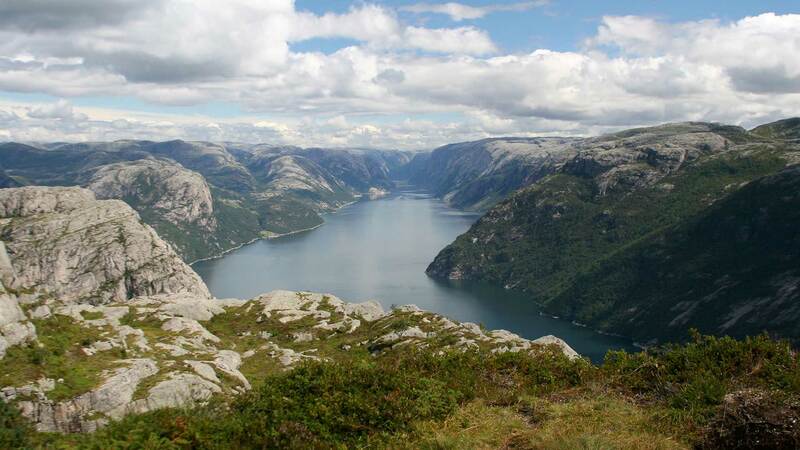 The hike is rated as demanding by the Norwegian Trekking Association. The route is 11km to Trolltunga, and starts with a steep 450 metre incline that is quite demanding. The total distance is around 22km and at around a 1000 metre incline. It is necessary to have good shoes, suitable for hiking, warm clothing and some extra layers, and food and drink for a full day tour. Dress according to the weather! 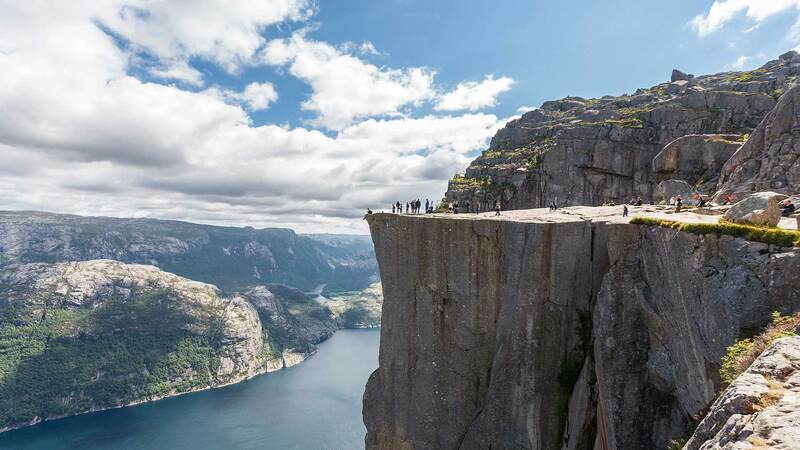 Preikestolen Hike: Self-guided, full day tour, starting with a 40-minute ferry ride from Stavanger to Tau and then a 25-minute bus ride from Tau to Pulpit Rock parking area. From the parking area the hike starts, which is a 6 km roundtrip journey that takes around 4 hours. The bus ride back from the parking lot has an open departure, so just choose one of the departures that fit your arrival time back from the hike. Bring hiking shoes, good clothing and extra layers according to weather and enough food and drink for the day. Kjeragbolten Hike: Self-guided full day tour, starting with a 4-hour and 15 minute bus ride from Stavanger to Øygårdstøl (07:30-10:45). From Øygårdstøl you will start the self-guided hike to Kjerag. The hike itself is around 5 hours long and is quite demanding. Bus return from Øygårdstøl to Stavanger is at 16:45. We can arrange a meet-and-greet on arrival at the airport in Bergen plus private transfer to your hotel for an additional fee. Contact us for details. Please note that some museums and activities in the countryside might only be available between the 15th of June to the 15th of August. This is an independent, self-guided tour. All accommodation, rental car and train or cruise travel (as specified in the itinerary) will be pre-booked by Nordic Visitor, but travellers are ultimately responsible for getting to hotels and to any train or cruise departure points by the specified times.